Brand new from Candy Lacquer is this PB&J duo! This is the first time I've reviewed for Candy Lacquer, but I am definitely already familiar with the brand. All the polishes I've ordered previously have been more beautiful than the photos in the shop, have smooth and consistent formulas, and shipped to me super fast. Sandra, the owner, is very kind and fun to work with! Not to mention the fun names she comes up with for each polish - which usually share what her inspiration was for the creation. 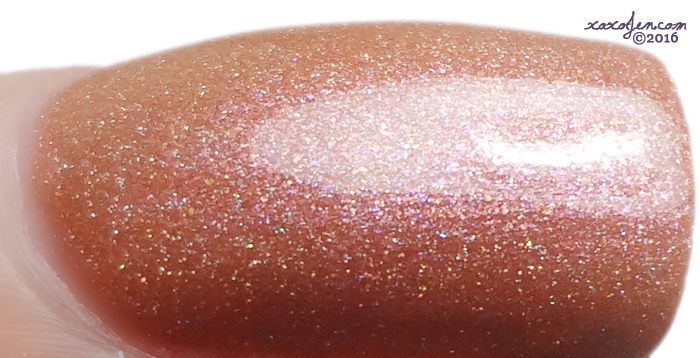 Peanut Butter Girl is a light orange brown holographic with pink shimmer throughout. Like it's namesake, it's a peanut buttery color! I wore two coats with topcoat for the photos. Formula was smooth and consistent, no clumping or pulling. Jelly Candy looks just like a yummy grape jelly! It is described as a deep orchid holographic with multi colored shimmer. I wore two coats with topcoat for a glossy finish, as this dries semi-matte on its own. Formula was smooth and consistent, no clumping or pulling. The accent nail is a base of Peanut Butter Girl, stamped with MdU and a jelly looking stamp design. I hope you have enjoyed this duo as much as I have! It is launching Friday April 22 at 9am Central. I also have some of the already launched spring shades coming up in a future review. Stay tuned! If you love these and want to keep up with future releases, be sure to follow Candy Lacquer on facebook! Hi Jen, I have a few shades from this brand and love them! I'll be looking forward to seeing your upcoming swatches of the spring colors.